Historians believe that the origins of tennis date back to 12th Century France. However, the modern game of 'lawn tennis' that we are familiar with was invented in England in the late 1860s. During the 1870s, Major Walter Clopton Wingfield popularised a version of the game by producing boxed lawn tennis sets that included a rulebook. Such was the success of Wingfield's version of the game that within ten years, lawn tennis had spread around the world. As the game gained in popularity throughout Australia, most country towns in the region started their own competitive Tennis Clubs. By the late 1880s, many homesteads in the Canberra region had tennis courts and hosted "tennis parties". On the 17th September 1898, the Queanbeyan Age reported, "A tennis court has been made at the back of the blacksmith shop at Hall, and a club formed." This would be the first Tennis Club in what was to become the ACT. By the early 1920's, Canberra's residents had established several Tennis Clubs in the fledgling City, often building their own courts with volunteer labour of club members. In early 1923, Committee Members of the Eastlake Tennis Club (formerly the Power House Club) established the Federal Territory Tennis Association with the aim of "inaugurating competition tennis" in Canberra. Over the years, the Association has had several name changes and is currently Tennis ACT who represents 30 affiliated Tennis Clubs. 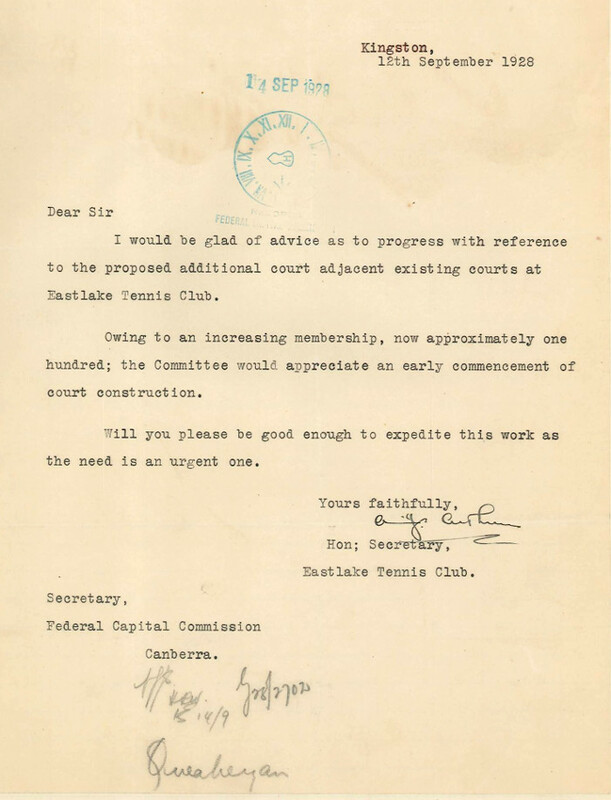 In the late 1920s, under the name Canberra Tennis Association (CTA), they made regular requests for additional courts and pavilions to the Federal Capital Commission (FCC). The file '47/1924 - Tennis Courts - General File - Including Provision of Pavilions' documents these requests and is ArchivesACT's Find of the Month. It provides a snapshot of Canberra's tennis facilities and demographics in the period 1928-1931. As the number of public servants in Canberra increased during the 1920s, so too did the demands on existing tennis facilities. During this time, the CTA made several requests to the FCC for additional tennis courts as well as provision of pavilions for the storage of equipment and comfort of club members. At the time, the FCC constructed clay courts using a base of "ant-bed" although the Acton Bachelor's Quarters Court had a concrete base. Ant-bed consists of termite (white ant) mounds that have been broken up and rolled out onto the ground. It is then soaked with water and rolled several more times, setting hard like concrete when it dries out. "The number and locality of names given to the various projects by Mr Honeysett are very confusing. Could not the localities be further named by mentioning Streets and Sections." "Perhaps the Assistant Chief Engineer has over-looked the fact that at the time my report was prepared there was no street nomenclature in existence, and therefore the allocations were described in detail to the best of my ability." In late 1928, the FCC conducted a review of existing tennis facilities in the Federal Capital Territory (FCT) in preparation of new leasing agreements. At the time, tennis clubs in Canberra were unincorporated bodies, so the FCC granted the leases to the clubs as trustees. The FCC charged rental of £1, £5 or £10 per court "according to circumstances" including pavilion facilities. You can download a copy of a draft 1928 Tennis Court lease here: ( PDF 1.25Mb). As part of the review, the FCC requested information on the number of courts and club membership from suburban tennis club secretaries. The following table shows the data collected that includes the population of all Canberra suburbs in 1928. We have also incorporated additional data found on this file for the tennis courts not included in the lease review. The file also includes a 1927 colour map showing the location of all public tennis courts in Canberra in 1929. Presumably, this was to aid in identifying the location of these tennis clubs as the Commonwealth Government had only just Gazetted Canberra street names in September 1928: ( PDF 641Kb). 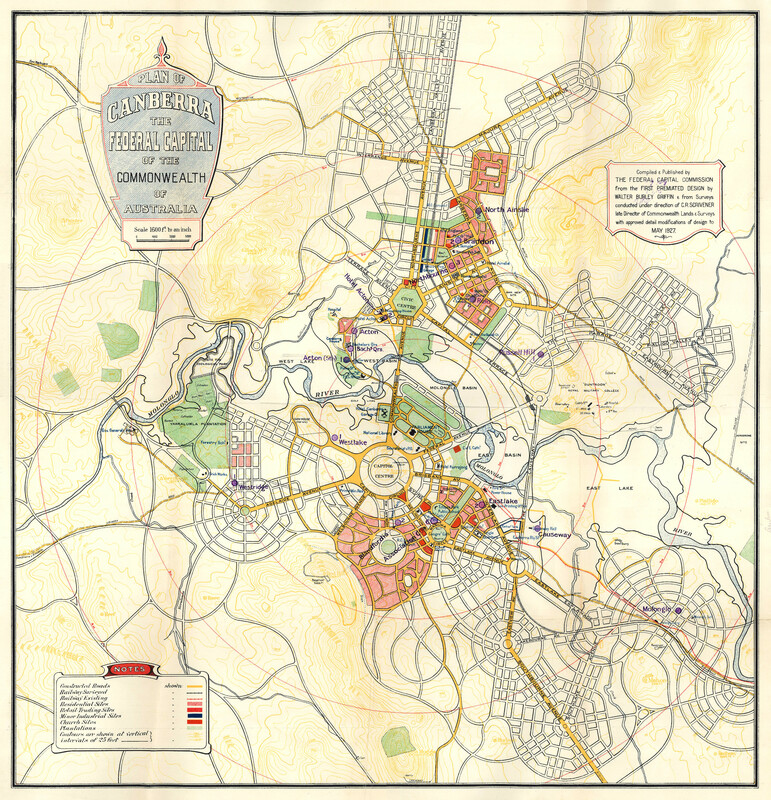 This map also shows the extent of Canberra's development in 1927 as well as the proposed town plan at that time. As can be seen from the map, many of these tennis courts remain in service today.